Photos: Katrina Kaif And Aditya Roy Kapur Heat Up Their Romance During Fitoor Promotions! [tps_footer]Bollywood actors Katrina Kaif and Aditya Roy Kapur are starring in a romantic saga ‘Fitoor’. The actors are on an unstoppable promotional tour for the film. Katrina and Aditya visited the NM College, Mumbai for promotions on January 27, 2016. 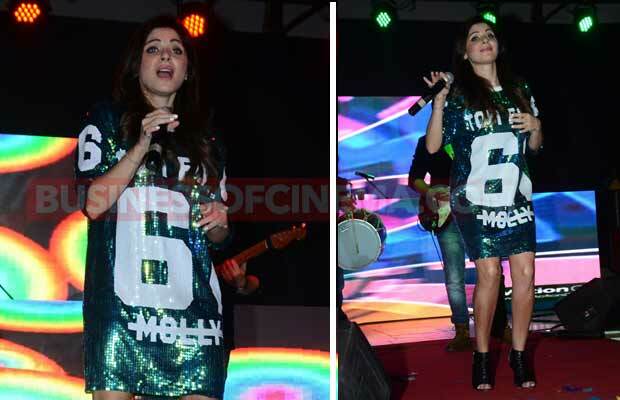 Kanika Kapoor was also one of the performers at the event. The ‘Fitoor’ lead actors attended the college fest in full enthusiasm. The actress looked gorgeous in a Varun Bahl floral embroided gown. Simple wavy hair and drop earrings completed her look for the event. Aditya looked smart in blue T-shirt and grey trousers. The duo gave a romantic performance on the song ‘Pashmina’. Previous articleVin Diesel Already Smitten By Deepika Padukone!